I have been on a bit of cooking/baking binge lately. By watching my nutrition more, I have really started to look at what goes into the food I eat. One of the items I do miss is granola bars. Well - here is a home made version! 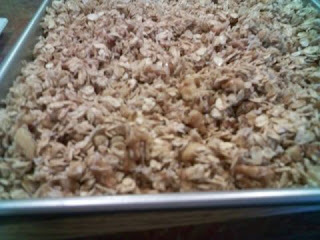 Not a bar, but granola! Baked it at 350 for about 40 minutes. After I pulled it out of oven, my wife added about a 1/2 to 3/4 cup of blueberries. It is now stored in the fridge and is ready to eat!